Luxury brand Lincoln is presenting the 2020 Aviator in Montreal as a Canadian premiere, an all-new seven-passenger, midsize SUV that will rival the Acura MDX, the Audi Q7, the BMW X5 and the Volvo XC90, among others. As standard, the Aviator will be equipped with a twin-turbo, 3.0-litre V6 that develops 400 horsepower and 400 pound-feet of torque, an engine that’s also offered in the Lincoln MKZ and Continental sedans. It’s matched to a 10-speed automatic transmission and—in Canada—an all-wheel drivetrain. 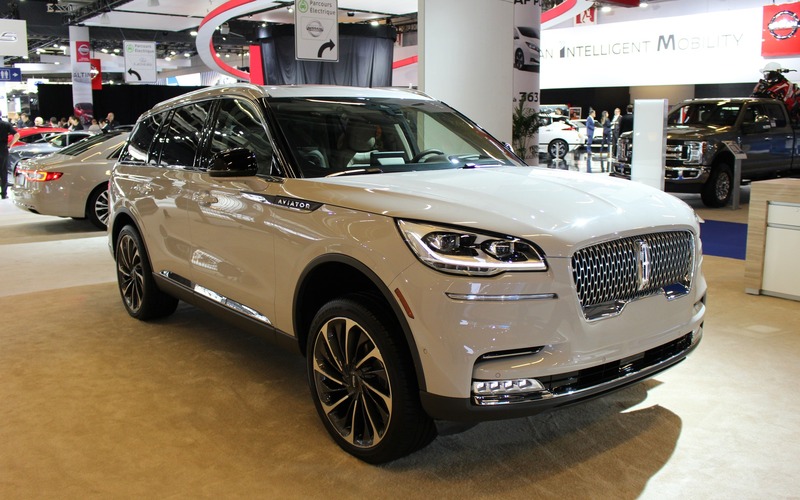 Also: 2020 Lincoln Aviator Makes its Comeback Official in L.A. However, the big news is the introduction of a plug-in hybrid powertrain that’s new for the Lincoln brand. In this case, the twin-turbo V6 works in collaboration with an electric motor to produce a combined output of 450 horsepower and 600 pound-feet of torque. This variant of the Aviator is called the Grand Touring. For now, the brand hasn’t revealed any information regarding driving range, charging times and performance figures, but the SUV will likely be very fast. The drive mode system will offer five settings, including Normal, Conserve, Excite, Slippery and Deep Conditions, while the Grand Touring will also get Pure EV and Preserve EV modes for maximizing efficiency. Another new technology that’s making its debut in a Lincoln vehicle is Phone As A Key, which allows owners to lock and unlock the vehicle, start the engine as well as open the liftgate using their smartphone. Phone As A Key can also recall seat and steering wheel positions as well as individual comfort and radio settings. The 2020 Lincoln Aviator will benefit from an optional air suspension that, using a front-mounted camera, reads the road ahead and anticipate rough pavement or potholes, and prep the vehicle to make the ride as smooth as can be. Occupants can also enjoy an available 28-speaker, Revel Ultima 3D sound system, 30-way Perfect Position front seats with massage function, wireless phone charging and an integrated Wi-Fi hotspot (data subscription required). Cargo space hasn’t been confirmed yet, but Lincoln says the Grand Touring version’s battery pack doesn’t cut in on interior room. Pricing for the 2020 Lincoln Aviator will be announced at a later date, and the SUV will go on sale this summer.